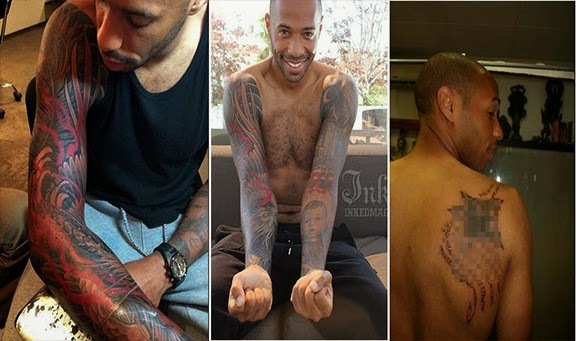 With all the money, hype, media and fame involved in football, these players some time get carried away with one too many tattoos. Now in a particular football matches you will see more players with tattoos than the players who don’t have. 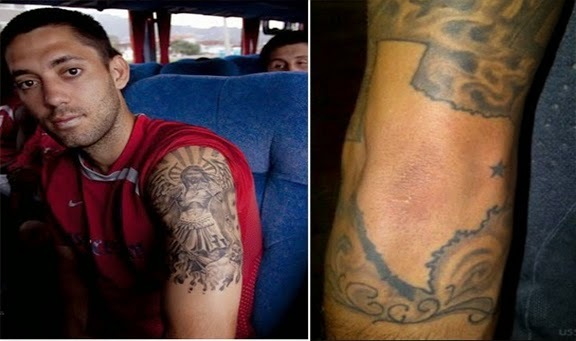 Today we take a look at ten footballers who just cannot get enough of tattoos. 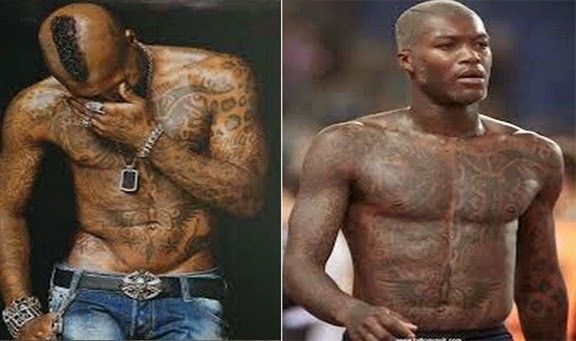 Former French international Djibril Cisse has his whole upper body (torso) tattooed with various ancient art tributes. He has more than 40 tattoos around his body. Probably one of the most tattooed footballer, Raul Meireles has his both tattooed and that too with colorful designs. Apart from that he has tattooed his wife picture on arm, daughter on leg and something on the neck. His wife is also found of tattoos as the picture suggest. Danish centre back has the best part of his playing days well behind him, now he is a bit part player for Liverpool. Agger is very found of tattoos and as you can see from the image whole of his back is full of ink, most of the inked stuff is related to “Viking history”. 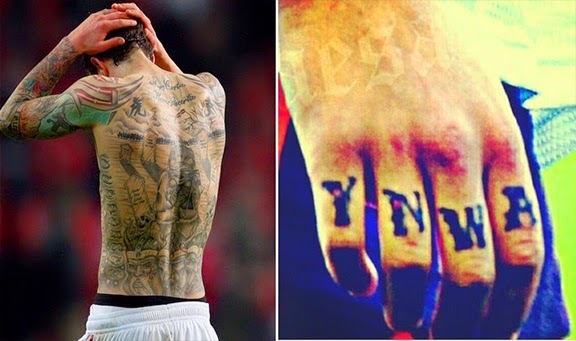 He also has a “YNWA” tattooed on his hand. Probably the greatest premier league and arsenal player in the last couple of decades, Henry spent 9 years with Arsenal before he moved to Barcelona to win the Champions League, which he did. Now playing his trade in New York and he is so impressed by new york scene that he has his left arm tattooed with famous placed of new york. Prince Boateng seems to be a big fan of body art, he has many tattoos on his body including. He took his love for ink to next level when he managed to ink one inside his mouth. Apart from that one of his tattoo is tribute to his ex wife. 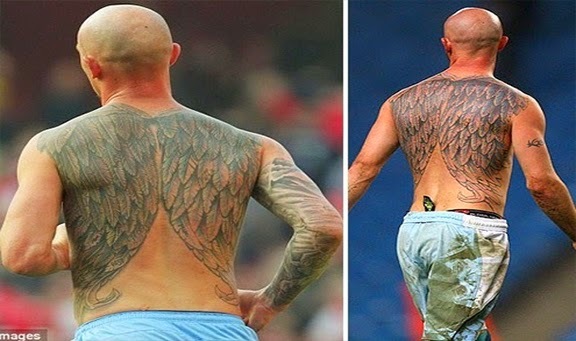 If Former Manchester City player Stephen Ireland choice of cars was not bad enough he has a big detailed wings tattoo on his back which looks pretty awful to say the least. 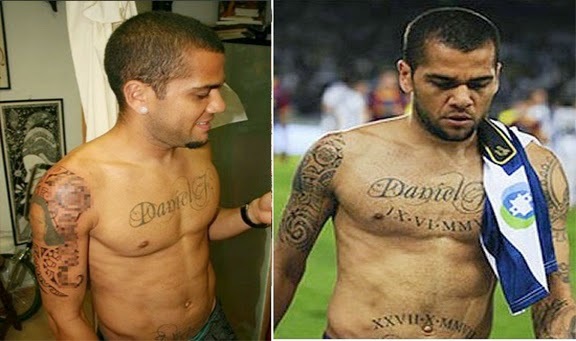 Brazilian full back also quite found of tattoos, he has a big image of his wife on his right arm, Jesus tattoo on left arm plus a big word “Daniel” on his chest, the name of his son. American player currently playing for Seattle Sounders, spend a few year in Premier League where he was part of Fulham and Tottenham teams. Scored a superb hat trick against Juventus in Europe league 2-3 years ago while playing for fulham. Although he is not all covered up in ink, but his tattoo on neck is weird plus recently he tattooed his left arm. The welsh striker Craig Ballemy played for many english clubs over the best part of last 15 years, now playing his trade with Cardiff City. 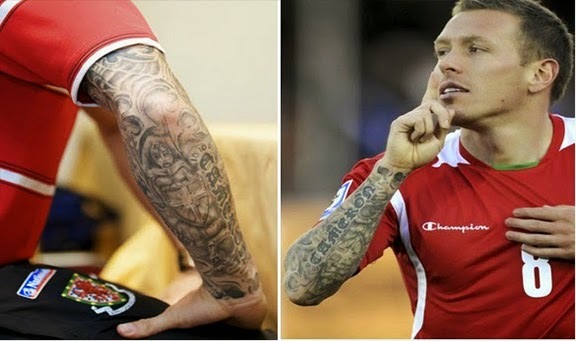 Ballemy has a “Battle of Pilleth” tattoo inked on his right arm which is most visible to viewers during his goal celebrations.